This rustic Craftsman exterior features varied gables and arch-topped windows with an eyebrow highlighting the entryway. A single dining space is open to the common areas for a spacious atmosphere. A large flex space room with fireplace at the rear of the home awaits the needs of the homeowner, ready to be used as a home schooling room, play room, or even a dining space for large gatherings. 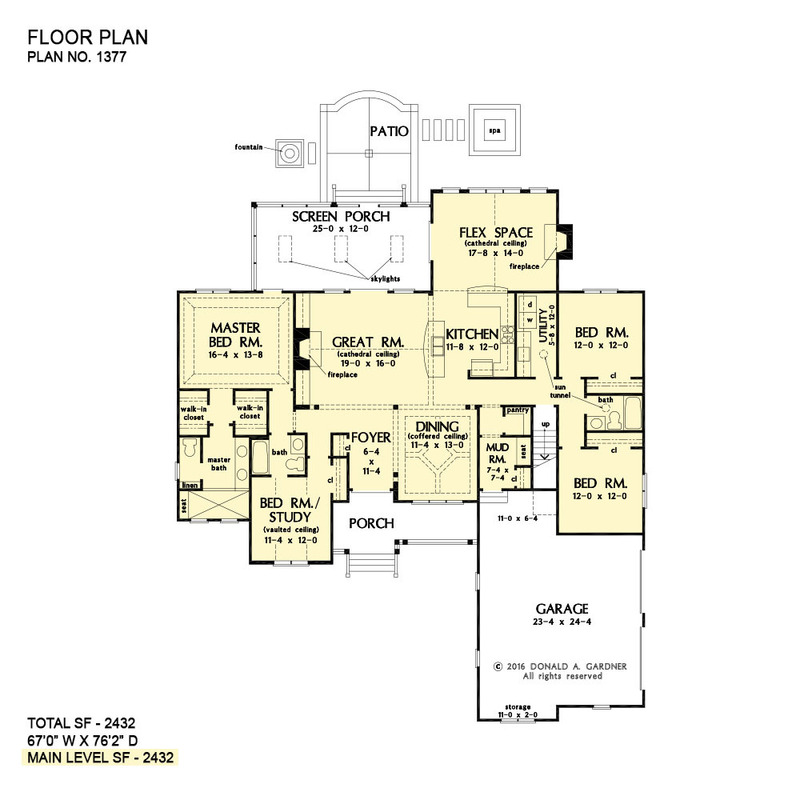 1st Floor: 2432 Sq. Ft. 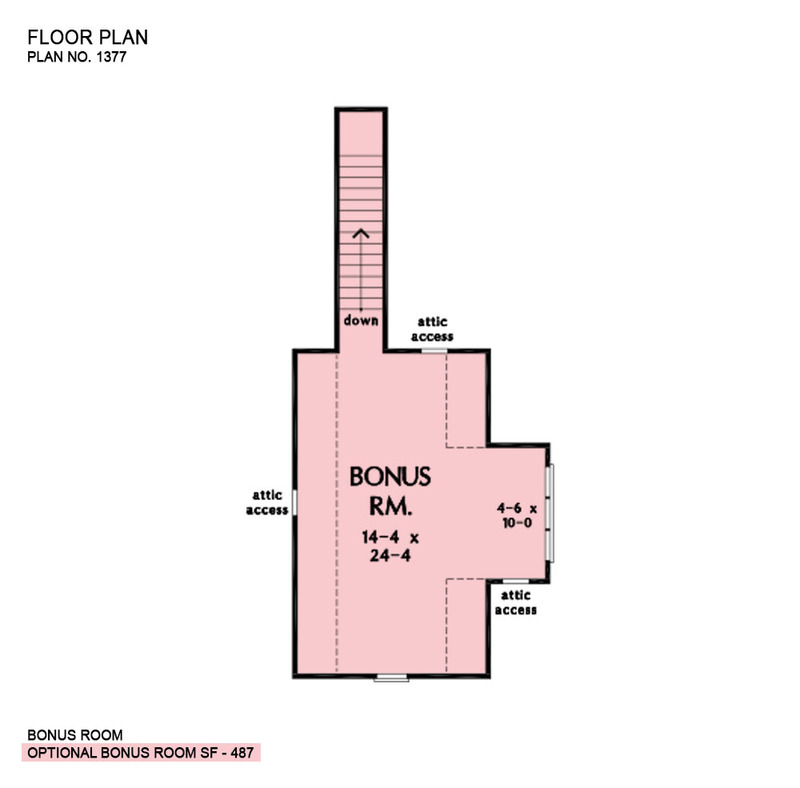 Bonus Room: 487 Sq. Ft.
Porch - Front: 147 Sq. Ft.
Porch - Screened: 325 Sq. 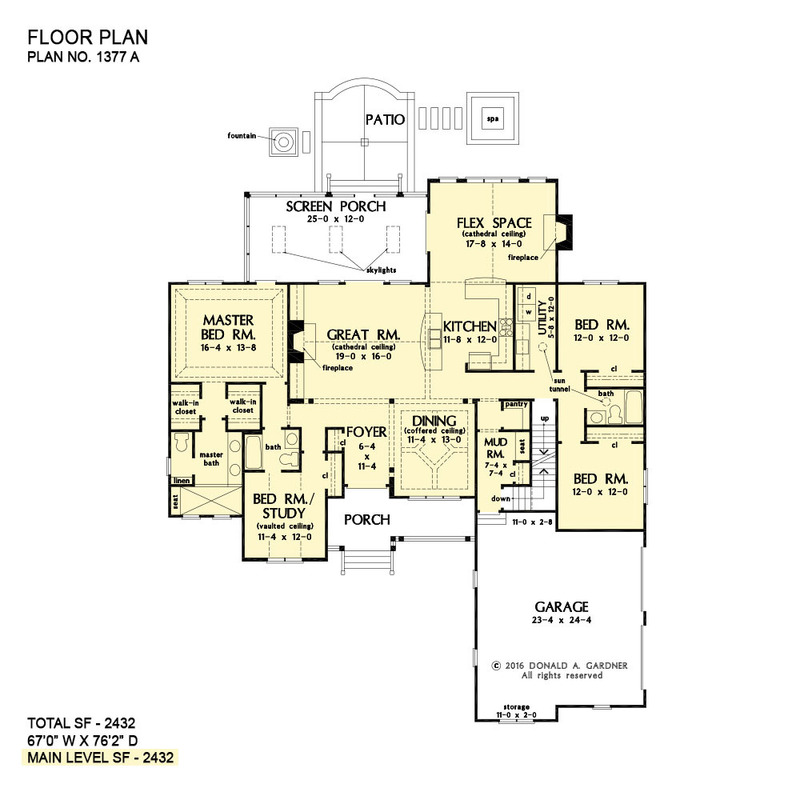 Ft.
House Dimensions: 67' 0" x 76' 2"
Master Bedroom: 16' 4" x 13' 8"
Garage Storage Bay (Flat): 11' 0" x 2' 0" x 0' 0"
Mud Room (Flat): 7' 4" x 7' 4" x 9' 0"
Flex Space (Cathedral): 17' 8" x 14' 0" x 15' 0"
Foyer (Flat): 6' 4" x 11' 4" x 9' 0"
Dining Room (Coffered): 11' 4" x 13' 0" x 10' 0"
Kitchen (Flat): 11' 8" x 12' 0" x 9' 0"
Utility Room (Flat): 5' 8" x 12' 0" x 9' 0"
Bonus Room (Clipped): 14' 4" x 24' 4" x 8' 0"
Garage (Flat): 23' 4" x 24' 4" x 0' 0"
Master Bedroom (Tray): 16' 4" x 13' 8" x 10' 6"
Bedroom / Study (Vaulted): 11' 4" x 12' 0" x 13' 0"
Bedroom #4 (Flat): 12' 0" x 12' 0" x 9' 0"
Porch - Front (Flat): 20' 8" x 6' 0" x 9' 10"
Deck / Patio (None): 14' 0" x 16' 0" x 0' 0"
Porch - Screen (Flat): 25' 0" x 12' 0" x 8' 11"